Since getting the boat listed we've been busy having fun. We started hiking and biking. All was good until Sherrell took a spill and landed on the edge of a curb right on her knee. It turned into a cantaloupe and we took her to the ER (after she somehow managed to bike 1.5 miles back to the car). Ouch! Completely fractured patella (knee cap). 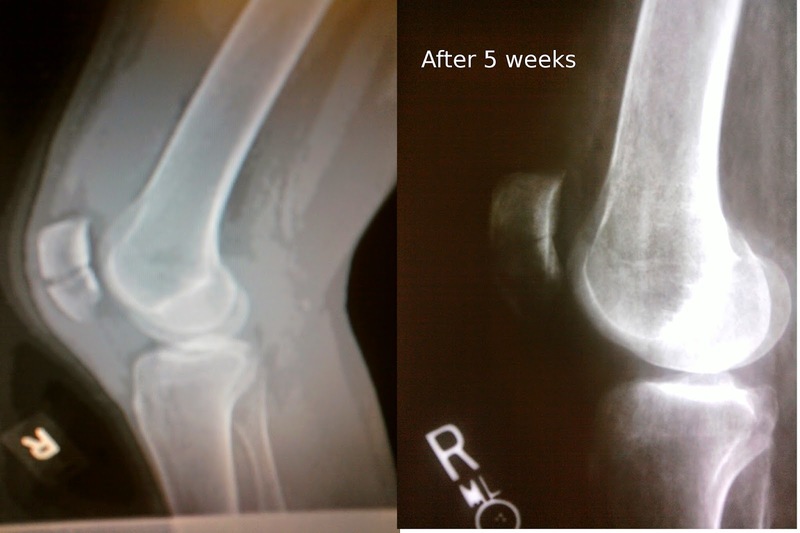 The image on the right is the ER and the one on the left (poor quality) after 5 weeks where it has fused to about 70%. It took about 8 weeks and now Sherrell is back on the bike and building up her muscles again. The tough part was we had to abandon our home immediately because she could not get on or off the boat at all. So we rented a fully furnished vacation condo (with hot tub) down town. It was actually about the same price as renting a run down 1 bedroom with no furniture. Now we are back on the boat and have moved to another harbor. We started a project to build ourselves a large rowing dinghy that we didn't mind getting dinged up because this harbor is a bit rough. We didn't want Sarana's main dinghy to get banged up after all the work we did on it for listing the boat. We started with plywood and some free plans off the internet. Here's basic structure with floor, walls, transom and the stations in place. Still needs the seams fiberglassed and the joints glued and filled. And this is what it looked like after it was glassed and the temporary stations removed. We just set the seat in there for the photo. The darker color of the wood is due to the 3 coats of epoxy we rolled on it to seal the surfaces and the white you see is the epoxy fills to even out the edges for fiber glassing. And here it is all painted with the hardware installed. Rowing it is fun because it is so light! Now we own 3 boats! And I'm sure the people on the dock are glad the project is done...no more sounds of power tools and shop vacs!